I have been appointed to the Cambridgeshire County Council committee responsible for scrutiny of policing and crime related matters in the county. The chairman of the committee, Cllr Steve Tierney, co-opted me onto the committee apparently as a result of the campaigning, lobbying, reporting and scrutiny which I have been doing on matters the committee has been, and is due to, be working on. I have been informed, by the County Council’s democratic services staff, that the next meeting of the committee is planned for the 14th of December 2011 at 2.30pm. The meeting information has not yet been published on the committee’s webpage which currently states: “There are no scheduled meetings”. This is something which ought be rapidly rectified. Over the past few years I have been closely observing the Police Authority, Cambridge’s Community Safety Partnership, and Cambridge City Council committees dealing with police and crime related matters. I have also commented on the operation of Cambridge’s magistrate’s courts, and have participated in national debates on policing, particularly surrounding the use of force and the relationship between the police and the public. Councillors have very broad responsibilities and committee members are rarely seen observing the operation of the various bodies whose performance they are charged with scrutinising. I was, for example, the only observer at the Interim Community Safety Countywide Board on the 24th of November despite this being the major strategic body operating in the area the scrutiny committee is constituted to monitor. I think co-opted members may be able to assist councillors who understandably find it difficult to find the time to specialise. Hopefully I will be able to make a more effective contribution to the committee’s work as a member than I would be able to from the sidelines via using the public speaking slot and lobbying councillors. One thing I would like to continue is obtaining greater openness from the police and criminal justice system. In order to have sensible and rational public debates on police and crime matters, which will hopefully occur in the run-up to elections of Police and Crime commissioners information on how the system is currently running needs to be much more accessible. One organisation particularly in urgent need of blowing open is Cambridgeshire’s Local Criminal Justice Board. I’d also like to see closer working with the courts, magistracy and judiciary who currently appear to me to operate in their own parallel universe. It has not yet been announced who will be representing Cambridgeshire Police at the meeting; though I of course am hoping for a chance to put questions to the Chief Constable, Simon Parr. It would be good to see Mr Parr make a public appearance as he has been keeping a very low profile for a chief constable. The committee’s terms of reference suggest it can require the attendance of the Chief Constable (A Chief officer of the police is considered a “responsible authority”). The formal name of the committee to which I have been co-opted is the Safer and Stronger Communities Overview and Scrutiny Committee. It as well as being the crime and policing scrutiny committee it has other responsibilities, recently it has been working on libraries for example. My understanding is that I’ve been brought in to focus on policing and crime, though I note there are policing and crime related aspects to many of the areas the committee is charged with overseeing, for example it looks at the work the council does safeguarding vulnerable adults and vulnerable people are disproportionally likely to be victims of crime and can be particularly adversely impacted by crimes against them. What Are Overview and Scrutiny Committees? 1 non-voting Police Authority member, nominated by the Police Authority, for ‘crime and disorder’ overview and scrutiny items only. The police authority representative ought be clearly identified on agendas and the committee webpage. This does not currently happen. 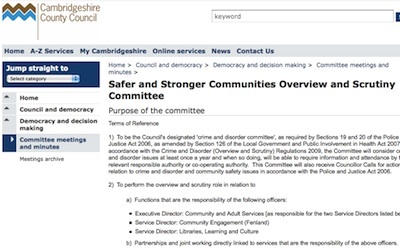 To be the Council’s designated ‘crime and disorder committee’, as required by Sections 19 and 20 of the Police and Justice Act 2006, as amended by section 126 of the Local Government and Public Involvement in Health Act 2007. In accordance with the Crime and Disorder (Overview and Scrutiny) Regulations 2009, the Committee will consider crime and disorder issues at least once a year and when so doing, will be able to require information and attendance by the relevant responsible authority or co-operating authority. This Committee will also receive Councillor Calls for action relating to crime and disorder and community safety issues in accordance with the Police and Justice Act 2006. Service Director: Libraries, Learning and Culture. b) Partnerships and joint working directly linked to services that are the responsibility of the above officers. I would like to know if a canvass for councillor calls for action been made? All all councillors aware of the role of the committee? S.19 of the Police and Justice Act 2006 requires the crime and disorder committee to review and scrutinise decisions and actions taken by the authorities responsible for crime and disorder strategies in the council’s area, these are defined in S5 of the Crime and Disorder Act 1998 as the district councils and the police force. An Overview and Scrutiny Committee may appoint up to three people at any one time as non-voting co-opted members, provided the appointments are made in accordance with paragraph 3 of the Overview and Scrutiny Procedure Rules set out in Part 4 of this Constitution. Each Overview and Scrutiny Committee shall be entitled to appoint up to 3 people at any one time as non-voting co-opted members of the Committee. The Committee shall determine whether the co-options shall be effective for a specified period, for specific meetings or for specific items. A Committee may not co-opt any person who is an active member of any political party. An active member is defined as any person who engages in political activities which would not be permissible if that person was an officer holding a Politically Restricted Post within the Council. (b) any decision taken by an individual member of the Cabinet. This is subject to exemptions for drafts and some confidential information (but not confidential information relevant to a decision). Rule 15 reads: “Members of the public will be allowed to speak on items included on the agenda for meetings of Overview and Scrutiny Committees in accordance with a public speaking scheme agreed by the Overview and Scrutiny Management Group.” I have made a Freedom of Information request for the public speaking rules which apply to the committee they should of course be proactively published. The committee, in its current form, has met three times, in May, July and September 2011. The Scrutiny & Improvement Officer informed the Committee that a member of Cambridgeshire Constabulary would attend in December to discuss Operation Redesign. Members expressed an interest in scrutinising the Constabulary’s use of its Control and Communication Centre at the same meeting. The Chairman commented that he had received a suggestion from a member of the public that the Committee consider the Constabulary’s use of restorative justice. The Constabulary’s report on the subject would be circulated to the Committee. The Service Director: Community Engagement, Mike Davey offered to provide a briefing on the appointment of Police & Crime Commissioners at the December meeting. There would also be an update on Integrated Offender Management at the December meeting. Councillor Hoy updated the Committee on progress with the Member Led Review on Domestic Abuse. She stated that she had learned that domestic violence was prevalent across all ages, classes and ethnic boundaries. All the Serious Case Reviews the County Council had considered in the recent past contained a domestic abuse element within them. In addition 75% of looked after children had come from a background of domestic abuse. The cost to agencies was profound with workers only able to intervene at a late stage. The County Council’s 2.5FTE staff capacity, which covered this area were overstretched. It was agreed that the interim report would be circulated to the Committee for comment and presented to 27 September Cabinet, recommending that funding be earmarked in the Integrated Plan towards tackling domestic abuse. A number of Members stated that they would be meeting with staff from New Directions, a local agency working in this field, and would report back to the next meeting. The Service Director: Community Engagement also recommended that Members receive a briefing from the Domestic Abuse Partnership Manager, Simon Kerss. This autumn tenants will be encouraged again to join Countryside Watch. Countryside Watch are running three Rural Crime Roadshows at Ely, Newmarket and Sawston in the autumn, to which tenants will be invited. An article promoting Countryside Watch will be included in the October tenant newsletter. In addition it is proposed to run an on farm workshop in the north of the County in October/November. The Cambridgeshire Community Safety Partnership was the Safer & Stronger Strategic Board and five local Community Safety Partnerships (one in each district). (The Safer & Stronger Strategic Board has now been replaced with the Interim Community Safety Countywide Board). The report notes public confidence in how the council and police deal with crime and anti-social behaviour is lower in Cambridgeshire than any of the councils in its comparator group. Another line I pulled out as notable was: “Quarterly updates of neighbourhood profiles appear to be a significant demand on time and resources and represent a cost of between £2,000 and £4,700 annually” that actually looks like a bargain to me; if those are county wide annual figures. If though they cost per ward then clearly that’s astronomical. It would be interesting to have some clarification. The lack of consistently between what senior staff from crime and policing organisations say at strategic meetings and what those working on the front line say was noted – I agree from my observations that this is a real problem. I have noted previously that there appears to be an opportunity for the police and county council crime statistics teams to work together rather than separately. Report on responses to a review of Integrated Offender Management from central government and CSPs were reviewed. Committee members questioned the rural crime action team who explained their role, as a seven strong team, in training other officers. Members queried the effectiveness of short sentences as deterrents to crime. Members urged the police to tell the public about the outcomes of investigations. This appeared to be a vague discussion on the Chief Constable’s reforms, the committee agreed to re-visit it in 6-9 months. ie. perhaps in the December 2011 meeting. The process for selecting senior staff for the six areas of operational command was discussed and the Chief Constable indicated that a representative from local councils would be on the selection panel. I’m wondering if that has happened; and to what extent the realignment of the force’s operational areas with the district council areas is improving local democratic influence and accountability. As far as I can see there is no policy on filming Overview and Scrutiny Committees. I suspect I will have more than enough to do on the day of the meeting without trying to film the meeting as well as participate and probably #live tweet too, but if anyone is prepared to operate it I have a camcorder and tripod which could be used to record the proceedings. Many county council committee meetings are held without microphones though, so it may be very difficult to get a good quality recording. If anyone wants to suggest any lines of questioning; or share views on if I should accept the £50 on offer for attending the committee, do let me know, preferably in the comments below. This entry was posted on December 1, 2011 by Richard Taylor. It’s great to see you getting stuck into it. I’m looking forward to the meeting and fully expect you’ll bring your unique touch to it. Cllr Tierney has clarified via Twitter DM that he’s co-opted me for the December meeting due to the fact the police will be there and not as a permanent member (so I won’t have to become an expert on Libraries!). “join” suggests a permanent membership. You’ll give some people a heart attack if you say that ROFL. Classic tactic of embracing the dissenters. I’ll assume good faith. It’s not going to affect what I do in any negative way. It’ll be a bit like just being offered a souped-up public speaking slot – with the opportunity to pursue a line of questions, and correct things, or seek clarification, if councillors or the police say things which are inconsistent with what has been published or said before. One thing the committee will have to do over the next eleven months is work out what role it will have once Police and Crime Commissioners are in-place. I think it will be important that the detailed work done by the Police Authority committees, particularly the scrutiny committee which monitors performance, but also the committees monitoring other aspects of the force, are replicated somewhere. Some of this work could perhaps best be done by the overview and scrutiny committee (some might go to the Police and Crime Panel, and any committees it sets up). The published versions of the papers are unreadable as they are word documents which require other non supplied word documents to open. It notes a private pre-meeting for members. I wonder if I’ll get invited to that. The agenda does not contain an item of The Constabulary’s use of its Control and Communication Centre or one on Restorative Justice; it is possible that these could have been intended to be raised during the item on “Operation Redesign”. If as noted as an action in the minutes of the September meeting “The Constabulary’s report on the subject [Restorative Justice] would be circulated to the Committee” it would be good to get that online. If it was made available before the next meeting that would be ideal so it would be possible to check if it was up-to-date and if not raise the problems during matters arising. The council will be publishing it tomorrow, it appears it takes them about a day to put a document online. 1) How much, if any, remuneration do you receive? 2) How do you square this with your views on the attention given to Residents’ Associations ? As clarified in the comments I was co-opted for the one meeting on December the 14th. The co-option was by a vote of ~8 councillors in favour and two abstentions – Cllrs Brooks-Gordon and M Smith. It’s yet to be seen if I’ll get co-opted again, but Cllr Tierney has indicated it might happen for a future meeting focusing on policing. (The committee has a wide remit). The procedures for co-opted members, including remuneration were approved by full council, as part of the recent constitution re-write. 1. Co-opted members of committees are offered £50 plus travel expenses. I declined this, as I’m interested in this kind of thing anyway. I would do all the required reading anyway, and be present anyway (assuming I was aware of the meeting). I also live very close to Shire Hall where the meeting was held. If the meeting was repeatedly held elsewhere in the County I may well have sought travel expenses. I have already drawn attention to what is offered in the article above.I reported the fact I declined it, live, via Twitter shortly after I was actually offered the paperwork relating to the payments. 2. My concerns over how residents associations influence Cambridge City Council are wide ranging. My key concerns are councillors putting undue weight on views claiming to be those of an association but actually being those of a small group or even an individual. I also oppose any public decisions being “delegated” to unelected and unaccountable residents associations. I find it hard to draw any close parallels between co-optees and residents associations though clearly neither are elected councillors. The overview and scrutiny committee does not make decisions, it makes recommendations, and co-optees don’t have a vote. Ideally councillors would stay on top of all matters they are required to oversee; however this doesn’t happen. For example at the meeting Cllr Brooks-Gordon launched into a defence of a type of restorative justice which bears little relation to the form of instant reparation being used by Cambridgeshire police, something she has done previously at the West/Central Area Committee. I can see benefits of bringing those with relevant knowledge, interest and expertise onto committees; essentially simply to help councillors. On policing you can see that County Councillors are not (with a couple of exceptions) not really robustly holding the police to account. No questions were asked of police authority representatives at the last full council for example. Public question slots can be really effective at allowing members of the public to suggest lines of questioning to councillors; very very often (almost always) points raised by the public in public speaking slots at police authority meetings or Cambridge City Council meetings etc. are then taken up by councillors during the debate. The presence of co-optees on overview and scrutiny committees is just a step up from the public speaking slot which allows contributions to me made at more appropriate points in the meeting. There was no public speaking slot at the 14th December Overview and Scrutiny Committee as the public speaking rules were released the day before and required three days notice of any questions/statements. I think there ought be better ways for individuals and groups to influence councillors. I’d like to see local parties invite members of the public to address their meetings (that happens elsewhere more than locally). In the case of the Overview and Scrutiny Committee; perhaps having the pre-meeting for members to organise and co-ordinate their lines of questioning in public; and having the public contributions there, then letting the councillors alone question the various people coming before the committee would be a better way of running things. That would though be more time consuming. However the procedures are what they are, as approved, democratically, by the full council. As someone pushing hard for improvements to our local police force, I’ll take the opportunities which are made available. If area committees effectively allowed me to question, and make suggestions to, my local councillors I would never have to venture further afield. Overall what I’m trying to do is strengthen local democracy; but that involves engaging with the current system. You could argue perhaps that I shouldn’t lobby, or use the public speaking slot at, the Police Authority as that body doesn’t operate to the standards of democracy and openness I would like. But it’s a system we have and that elected representatives were responsible for setting up. Most people who have commented on it seemed to feel that your participation was valuable and that the ‘experiment’ (a chairmman inviting an interested member of the public to be a member of the committee for a full meeting) was a success. To be honest it was something that got me a few askance looks, particularly after the events of the previous day ; ) But I am trying to do something different with my Overview & Scrutiny Committee and it is something that I believe is supported by the principles that the council are now putting forward for how O&S should engage with the wider public. I agree that it would be a good idea to invite members of the public to speak and address future meetings. This must be done in a non-partisan way so hopefully other committee members and interested parties might make suggestions for suitable candidates.